Though Kefir has already caught the imagination of fitness enthusiasts and celebrities, it is still relatively unknown to the public at large. And what could be the reason for the near-obscurity of such an amazing natural and wholesome food? 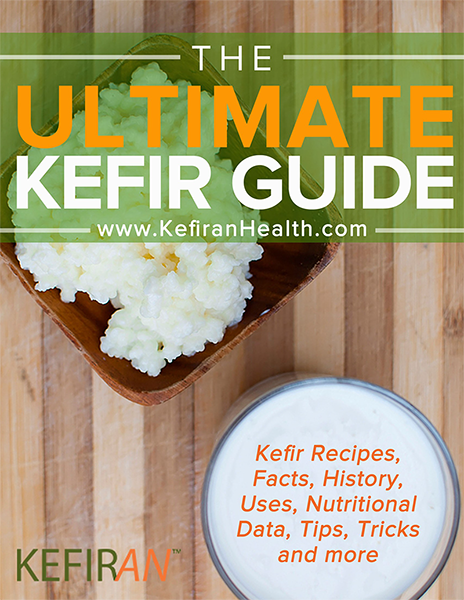 The Ultimate Kefir Guide will not only give you some great kefir recipes to try but it will also tell you everything you needed to know about Kefir. So, What Exactly is Kefir? The Ultimate Kefir Guide will give you the recipe to make your own home made Kefir. With that kefir you can then try amazing easy to make kefir recipes ranging from Breakfast, Smoothies, Salads, Snacks, Deserts and more. Are you lactose intolerant and looking to avoid dairy and or gluten? The Ultimate Kefir Guide includes some healthy kefir recipes that are not only delicious but non dairy, lactose free, gluten free and low on calories. 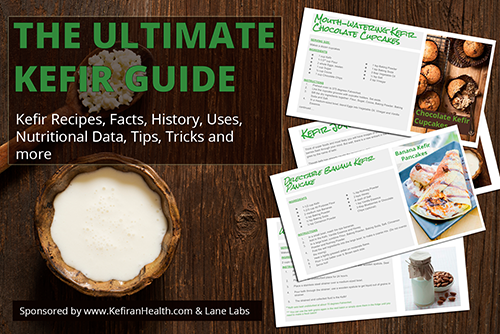 Get Your FREE Ultimate Kefir Guide Now. Enter your email address to sign up to get the Ultimate Kefir Guide + Recipes right away! *Lane Labs – USA, Inc. (kefiranhealth.com) can use my personal data (including e-mail address) for marketing, advertisement and opinion research purposes.